A preview of what to expect from Professor Victor Shih in his Destination GPS presentations in New York City and Washington, D.C. If you want to know what’s on Victor Shih’s mind, do as thousands of others do: Follow him on Twitter. Since joining the social media platform in 2009, the associate professor at the UC San Diego School of Global Policy and Strategy (GPS) has ignited quite the fan base with his frank and witty two cents on China’s politics, economy and finance that he is most renown for. He has nearly 12,000 followers. But he’s not always remarking on news articles regarding China’s financial ups and, more recently, downs. He also retweeted a reminder of his “The Role of the Chinese Government in Preventing a Global Financial Crisis” talk in New York City on March 22 and in Washington, D.C., on March 24 as part of the School’s Destination GPS series. To that end, East Coast alumni and friends of the School can get a taste of Shih’s candor in person and learn more about how he garnered such expertise in the first place. It started with his adviser as a Ph.D. candidate at Harvard University, Roderick MacFarquhar, Leroy B. Williams Research Professor of History and Political Science. Instead, Shih addressed something MacFarquhar missed—how elite politics affect financial politics in China. “It’s been a good niche because I think very few people think about the connections,” he said. In addition to his published works, Shih also has pioneered the quantitative studies of the Chinese elite. 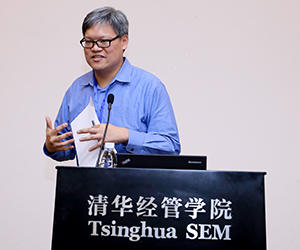 As an associate professor at Northwestern University, he created what is arguably the largest database on biographical information of elites in China. It’s a project that found a turning point after he joined GPS in 2012, receiving with UC San Diego Professor of Mathematics David Meyer a grant from the Department of Defense to expand the database by thousands more individuals and update it through 2015. “Anyone interested in networks and the effect of political networks on political outcomes can use this database,” Shih said. For instance, the theory that bureaucrats who attended a certain university make better policy can be tested by referencing the database, Shih exampled. “We have made a huge amount of progress,” he said, adding the ease of cross-campus collaborations at UC San Diego such as with the Department of Mathematics has been a big factor. Shih also serves on several dissertation committees for the Department of Political Science. “UC San Diego has always had and continues to have a very strong reputation in political science and China studies—two areas for which I have a great deal of passion,” he said, noting the quality of Ph.D. and graduate students the university recruits were a part of his motive to join GPS four years ago. 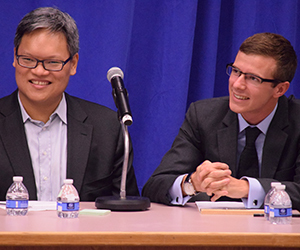 In fact, Shih tagged his participation in the student-led 2014 China Focus Debate, which he won against Professor Barry Naughton, as “one of the greatest things I did at GPS.” He defended with two student debaters that the Chinese economy would see a severe crisis within five years. The intimate class is somewhat inspired from his real-world experience working for The Carlyle Group in between his professorships at Northwestern and GPS. Needless to say, the 14-hour days “chained to a desk” weren’t for Shih. And as part of his Destination GPS participation, alumni also will have the opportunity to absorb that knowledge, specifically Shih’s take on how China dug itself into a financial hole and the challenges for the government to thwart capital flight. Until then, you can follow—or challenge—him on Twitter at @vshih2.